Paul's Desert is a retail nursery specializing in landscape cactus and succulents that proudly serves San Antonio, Schertz, Laredo, Del Rio, Austin, Houston, Corpus Christi, and all other communities in South Texas. We don't offer grass, top soil, trees, or shrubs, we do offer you the opportunity to acquire cactus and succulents from all over the world that are very beautiful and majestic. In addition to these cactus and succulents, we also offer repotting service and Paul's Desert cactus soil. Come by our retail cactus and succulent nursery and we will educate you on proper applications and growth techniques. While at the nursery shop our selection of Navajo pottery, jewelry, sand paintings, Zuni fetishes and other Native American art. We also carry polished rocks, polished and unpolished petrified wood. Types of cacti and succulent plants we carry: Astrophytum, ariocarpus, Thelocactus, Ferocactus, Ocotillo, Mammillaria, Aloes, Agave, Pachypodium, Adenium, Euphorbia, Lithop, Echinopsis, Echinocereus, Parodia, Cyphostemma and many more. When you're looking for cactus and succulents, accept only the best. 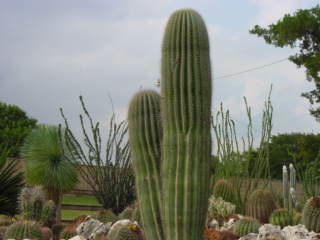 Since 1991, we have been providing you with the best cactus and succulents from around the world. Our retail nursery has an 1,800 square foot indoor green house and more than 1/2 an acre of outdoor growing area that displays some of the finest cold hardy landscape cactus and succulents. If you love cactus and succulents, you have to stop by today.